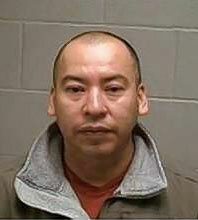 Jose Gonzales, attempted murder suspect. Highland Park police and firefighter/paramedics responded about 10:13 p.m. to a report of a domestic-related stabbing at a home on McGovern St near Deerfield Road. on Friday January 5, 2018. A female patient was transported to Level I Trauma Center Northshore Evanston Hospital by Highland Park Fire Department Ambulance 32’s crew. The woman was initially listed in critical condition, but was stabilized. A Highland Park man, who shared a home with the female victim in the block of 1600 McGovern Avenue allegedly stabbed her has been arrested. There were children in the home at the time of the stabbing, and apparently the male suspect was delayed from fleeing by the children. Police found several juvenile witnesses with minor injuries, and were able to get a description of the suspect. Highland Park police and area police were immediately searching the area of McGovern Street and Laurel Avenue, where the male suspect was last seen. The suspect was described as a male/Hispanic with a mustache, wearing a black shirt. With the help of police officers from neighboring communities and a Lake County Sheriff’s Office K-9 unit police were able to apprehend a man matching the description nearby. Jose Gonzales, 39, of the block of 1600 McGovern Avenue, was charged with attempted murder, aggravated battery, aggravated domestic battery and domestic battery. Police say suspect that Gonzales repeatedly stabbed the woman during the Friday night dispute at his home on McGovern Street, just north of Deerfield Road. Three children did not require medical attention, and were released to the custody of relatives. Bond for Gonzales was set at $300,000 Saturday Janurary 6, 2018 in Lake County circuit court. According to the Lake County sheriff’s office, Gonzales also has pending separate charges of driving drunk without a license. In the DUI incident, Gonzalez was arrested shortly after 10 p.m. on September 27, 2017 and charged with DUI after police were called to a verbal dispute, according to police and court records. Also in the DUI incident, the Highland Park police stopped Gonzales near the shared house — about a block north and one-half block west in the block of 800 Laurel Avenue. Gonzalez has an attorney status hearing set for Wednesday January 17, 2018, and a preliminary hearing scheduled for Wednesday January 31, 2018.